HOUSTON — While most people across the United States are getting ready for bed or already fast asleep, astronauts on the International Space Station are just getting to work more than 200 miles above Earth. The space station has been a beehive of activity for the last week, with 12 astronauts working a skewed overnight schedule to install experiments, perform spacewalks and deliver supplies. NASA's shuttle Endeavour has been parked at the station since May 18, and today (May 23), a Russian Soyuz space capule will leave the orbting lab to bring three crewmembers back to Earth. All the comings and goings in space have not only made things a bit more crowded on the station, they also have Mission Control juggling different sleeping shifts in space for the two crews, as well as overnight hours on the ground. "The sleep shifting is specifically designed to match the hours that they need to be awake to support undocking and landing in Kazakhstan on Monday," NASA spokesman Rob Navias told SPACE.com. "When Endeavour's mission moved into the timeframe of the Soyuz departure, the flight control teams, in concert with the Russian side and ISS program, worked with flight surgeons to identify common ground where they could have the shuttle crew up and working when they needed to be up and working, and vice versa for the departing Soyuz crew." Staying behind on the station are three other crewmates: Russian cosmonauts Alexander Samokutyaev and Andrey Borisenko and NASA astronaut Ron Garan. 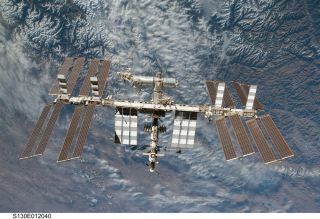 Endeavour's six-man crew, commanded by Mark Kelly, launched toward the station May 16 and will return to Earth June 1. To help Kondratyev, Coleman and Nespoli prepare to return home, but also allow enough time to complete the work that needs to get done, the sleep times for the station and shuttle crew are staggered, NASA officials said. Typically, when space shuttles visit the station, mission controllers try to match the schedules of the two crews, but the timing of Endeavour's arrival, the Soyuz undocking and then the shuttle's own undocking on May 29 requires some shuffling. "As far as the overlap goes, its different from what we've done in the past, and we have to do it to support the Soyuz undock mid-mission, 'cause you've got the Soyuz landing on one side of the planet, and then the orbiter's going to want to land here in Florida on the opposite side of the planet less than a week later," explained lead shuttle flight director Gary Horlacher. "To make that work, you have to have this overlap going on. So it is a little different than what we've done in the past, but it's not significant." In the meantime, the shuttle astronauts will sleep several hours ahead of the station crew. For example, today the shuttle crew went to sleep at 2:26 p.m. EDT (1826 GMT) and the station crew finished up their day at 5:31 p.m. EDT (2131 GMT). "It's working out great," Coleman said of the unique sleeping schedule. "They were totally quiet, it's like any other morning on the space station. Plus we work hard, so we're pretty tired." "It was decided that Garan would sleep shift with the shuttle crew because his activities were more importantly allied with shuttle crew activities than the departing crew," Navias said. And despite the differing schedules, NASA does not anticipate any complications as a result, Navias said. Flight controllers have worked hard to arrange schedules and prioritize mission objectives to avoid conflicts and ensure that operations continue to run smoothly. There are, however, some things that both the astronauts onboard, and the flight controllers on the ground, will have to keep in mind while the crews have varied sleep times. "When you have staggered sleep shift, you don't want a call going up from [Mission Control] to a location on the station where people are sleeping," NASA spokesman Kelly Humphries told SPACE.com. "The crew members who are awake try to avoid areas where crewmembers are asleep, although the Crew Sleep Stations do provide some privacy, which helps with this." "It is shuttle crewmembers who may be sleeping on station in certain areas on certain days that can be more of a problem," Humphries said. "For example, [astronaut Greg] Chamitoff asked for the wakeup music to be sent to him today when he was sleeping in the shuttle, instead of on a day when he would be sleeping in Quest before a spacewalk." With 12 spaceflyers currently on the space station, even those of us here on Earth can relate to the perils of a full house.